Tony: Sun Up is the worst horse on the track. Dr. Hugo Z. Hackenbush: I notice he wins all the time. Tony: Only because he comes in first. And they're off! This second Marx Brothers picture at MGM, the last one under the auspices of Irving Thalberg, is another instance of the boys at their best. It may not shine quite as brilliantly as its predecessor, A Night at the Opera, but it still works very well, includes some of the funniest set pieces that the Marxes ever put on film, and has weathered the years as one of the daffiest film comedies of all time. The picture very much follows the template established by A Night at the Opera, in plopping Groucho, Chico, and Harpo down into what, on paper, sounds like a fairly conventional melodrama. Here our young heroine Judy (Maureen O'Sullivan) is up to her eyeballs in debt, and is going to lose the family business, the Standish Sanitarium, to greedy bankers, who want to turn the place into a casino. Judy's beloved, Gil (Allan Jones), has bought a racehorse, which he intends to run at the track nearby, collect great pots of cash in winnings, and tell Judy's debtors where they can go. It's just about the oldest possible set-up, with the Snidely Whiplash figure preparing to tie the young maiden to the train tracks, or thundering at her, "You must pay the rent!" Of course, that's just the frame�what makes the movie as pretty as a picture is that the terrible trio are in the foreground. Despite its title, most of the film doesn't in fact take place at the track; we spend the bulk of our time at the sanitarium, which is not an insane asylum, but more like a spa for the worried well, or the Very, Very Nervous. The guests there, rather like in The Magic Mountain, have come to take the cure; among them is, shockingly, Margaret Dumont, playing the rich and widowed Mrs. Upjohn. (You cannot fathom my pride at analogizing a Marx Brothers movie to Thomas Mann.) Dissatisfied with the Standish faculty, Mrs. U insists that only one doctor can cure what ails her�the famous Dr. Hugo Z. Hackenbush, on whom she clearly harbors a crush. The joke is that not only is the good doctor played by Groucho, but that his specialty is quadrupeds�he's a veterinarian. Helping out around the hospital is a flunky with a felt hat and an absurd Italian accent; he's called Tony, and of course it's Chico. And doing what he can to ride to glory nearby is Stuffy the jockey�i.e., Harpo. The story is certainly serviceable, but the stellar bits are the comic set pieces, the best of which may be Chico and Groucho at the track, with the former shaking down the latter, ostensibly providing Groucho with tips on the next race. But equally hilarious are the proliferation of Dr. Steinbergs when it's time to examine Mme. Dumont, or Groucho dancing with the rich widow while simultaneously trying to put the moves on a slinky young thing across the floor. Also, Harpo and Chico play the silliest game of charades in film history. 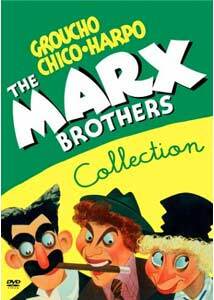 The movie also has some of the best one-liners in the Marx canon�e.g., when Groucho is asked: "Are you a man or a mouse?" "You put a piece of cheese down there and find out." But it's well worth tolerating just a modicum of unfortunate moments to enjoy the film, which climaxes in the inevitable horserace. Seabiscuit obsessives may want to have a look at this, as well, for these sequences were shot on location at Santa Anita, perhaps the most beautiful racetrack in America. Image Transfer Review: Picture quality is fair enough, with only a small amount of acid burn and other marks of the years. As with A Night at the Opera, this is certainly the best this film has looked for home video purposes. Audio Transfer Review: The limits of mono are frequently all too clear; some of the dialogue is muffled, and in long shots especially, you can tell where the microphones are placed, as the characters move around the room, their volume levels changing drastically. Then again, do you want the Marx brothers muffled in mono, or a stellar 5.1 track of Carrot Top? Extras Review: The extras package provides some insights and some laughs, which is about what you would hope for. The commentary track, by Glenn Mitchell, author of The Marx Brothers Encyclopedia, is unusual in a number of respects. Mitchell takes a historical, academic approach, which no doubt the Marxes would not approve of; his British accent only adds to the air of high seriousness. But he's got some good points to make�e.g., Irving Thalberg died during production, which may have resulted in some of the storytelling imbalance. Also, he's very good on director Sam Wood trying to rein in his leading men�he routinely knocked heads with Groucho, and spent an inordinate amount of time tracking down Chico, who was making time with the ladies. But Mitchell has some long, empty patches; he's bored by some of the musical sequences, and skips them, encouraging us to do the same. It's very odd to hear this from a film historian: "At this point I shall leave you, because I have nothing to say about this." On Your Marx, Get Set, Go (27m:36s) features the same talking heads from the same interview sessions that you'll see on the documentary that accompanies A Night at the Opera, though Maureen O'Sullivan is added to the mix here; largely, it's a celebration of the movie's comic set pieces. In a delightful period short, Robert Benchley and the wife go out for A Night at the Movies (09m:59s); chaos ensues. There are also three vintage cartoons�the first two feature The Captain and the Kids, staples of the MGM children's fare. The first concerns Old Smokey (09m:59s), the Captain's horse; in the second, the boys set out to buy Mama's New Hat (08m:24s) for Mother's Day. The last, Gallopin' Gals (07m:27s), is notable both for being in color, an for being an early effort from Hanna and Barbera; it keeps up the equine theme, with a group of mares chatting it up on Derby day. Finally, along with an original trailer, are two bits of audio arcana. The first, introduced by Mitchell, is an outtake (02m:33s) of a song that didn't make the final cut; and the second, Leo is on the Air, is a primitive EPK, a radio promo for the movie, featuring highlights of some of the funniest comic bits. You want a sure thing? Put down that Daily Racing Form, and bet Harpo, Chico, and Groucho to win, place, and show. Another stellar effort from the brothers, handsomely and generously packaged on DVD from our friends at Warner Bros.